Are you looking for a new clutch? One with style? 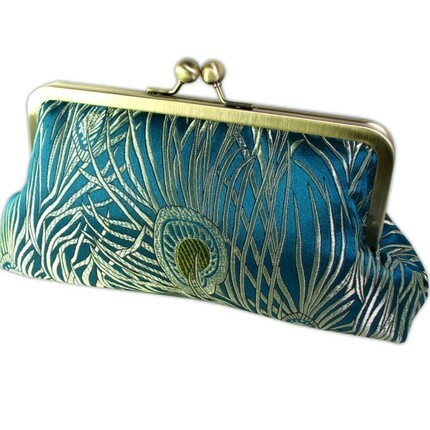 Rosemary, from the Etsy shop Clutch That, is sure to have something for you. All of Rosemary’s beautifully unique clutches are hand made out of the highest quality material. Rosemary specializes in “Peacock Clutch purses, brides and bridesmaids clutch purses, evening bags and many other clutch bag styles”. Each bag she creates are done with the greatest care and “attention to detail”. On orders of 3 or more, Rosemary offers complimentary embroidered personalization. Include a monogram or even a special date. When you have a chance, take a minute to check out this lovely Etsy Shop. Your new bag may be waiting for you there! Hi Kel, I click on her esty store you provided and the purses while lovely are a little pricey for my pocketbook and I can't be sure of the size because they're all in "cms", ugh. Anyway thanks for the heads up. I'll keep my eyes on them for a day or two because they are cute. Oooops, I'm sorry, the bags do show the inches in front...my sister had to point it out to me. Ok, beautiful designs on these purses for sure. I do like them. I adore clutch purses, whenever I go out my friends are always peeping out my new purse. I try to get something funky that stands out. Man I haven't looked for a purse in a minute. Time to hit the stores, lol.